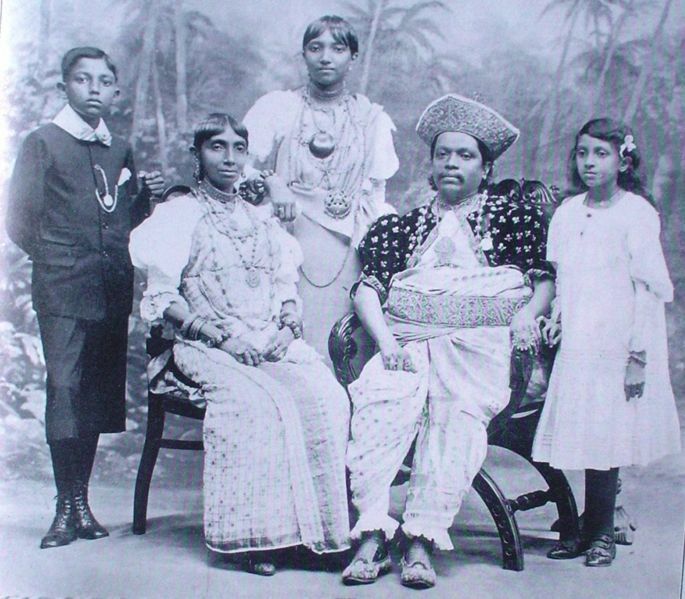 The caste that is presently called Kandyan Radala is a class created by the British rulers in the 19th century. The founders of these new Radala families were mostly from the coastal western province and were Anglican Christians. Their home base was the Sabaragamuwa province which abutted the western province. Prior to the creation of this new group, the 'original Radalas' of Sri Lanka were the top military officials of the kings. Traditionally they were of warrior stock and they were the nobility of the Kandyan Kingdom. 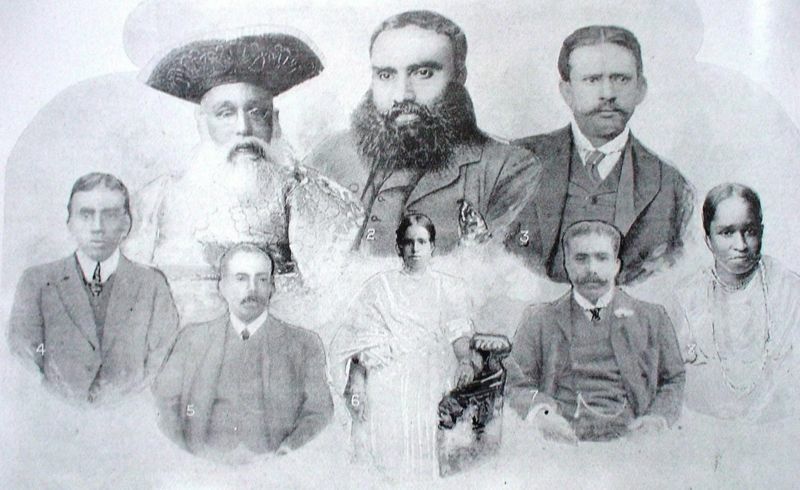 Many of these real Radalas were Indian princes connected to the Vaduga Nayakkar royal family of the Kandyan kingdom. These princes, (referred to as Malabars by the British) were the commanders of the Kandyan army right up to the end of the Kandyan kingdom (Pieris 1939 pg 232). The modern Sinhala words Mahanayaka, Nayaka (Maha Naik, Naik) etc. which now mean chief monk, chief etc go back to the days of these Nayakkar princes. 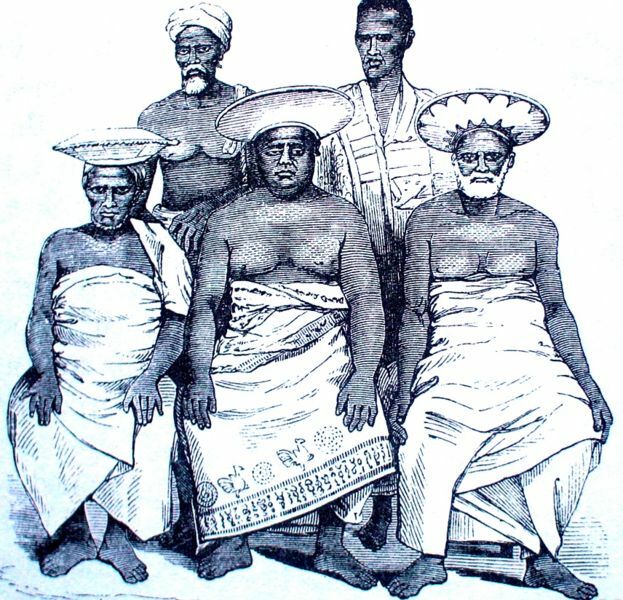 A group of Kandyan Chiefs from Tennent’s Ceylon, published in 1859. 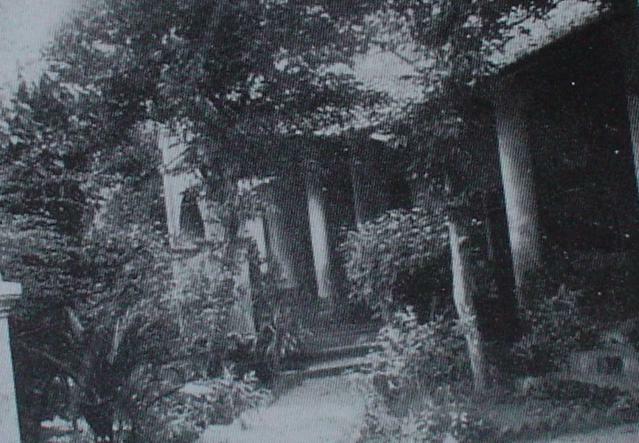 The Kandyan convention and other documents from the Kandyan period confirm that the Radala appellation was restricted only to the Adigars and a few others until the monarchy was ended. However after the fall of the Kandyan kingdom, the British conquerors and others have labeled almost all the palace courtiers including the lowly ones as Radalas and created a Radala caste. Prior to this there is no evidence to show that the Radala title of the high official was inherited or inheritable by any family. These courtiers were often the offspring of the king's harem women (Yakada doli literaly translated as iron maidens, harem women - as against Ran doli ie. golden consorts who were queens of royal stock). Such Yakada doli women were not of royal stock. As such by custom their offspring could never aspire to be kings (example of Unambuwe Bandara etc) but many of them, the sons of favourite concubines, served the palace as courtiers. After capturing the Kandyan provinces in 1815, with the aid of locals from both maritime and Kandyan provinces, the British created yet another class of Radalas- an extensive class of loyal ‘New Radalas’ in the Kandyan territory. While some of them assisted the British in the administration of the Kandyan province others were mere ceremonial figures who were dressed in exotic costumes and made to wait in attendance on British Government Agents and lower officials. The Kandyan costume is a European inspired 19th century uniform with a Spanish styled jacket and hat. The low country native employees, the British appointed Mudaliyars, of the southern provinces too had a European imposed uniform with a western coat teamed with a Malay cloth and Malay tortoise shell combs. 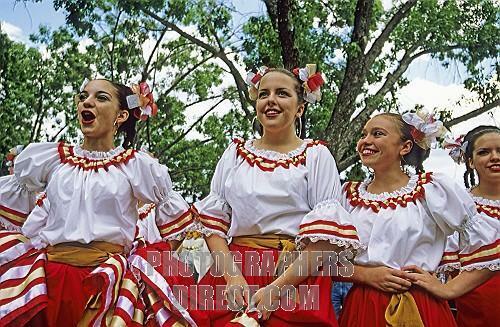 Above: A popular European outfit from the 16th - 17th centuries from which the Kandyan costume was created. The early kings and queens of the Kandyan kingdom had been baptized and educated by Portuguese missionaries. Note the hat, the jacket and the sleeves. Similarly see below for the Spanish inspired Lama Saree for girls. 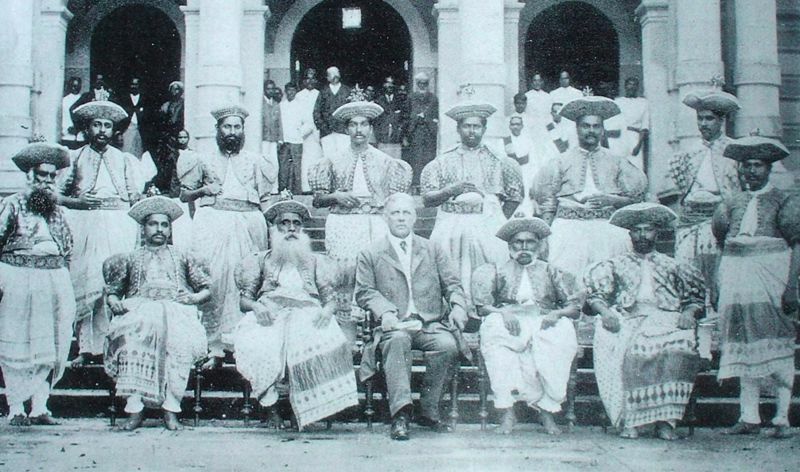 Right: A group of British appointed Kandyan chiefs, with Hon. J. P. Lewis, Government Agent in 1905. The chiefs have adopted the dress of traditional Dissawas by this time but still haven’t started using other traditional insignia of high office such as jewelry, ceremonial daggers or footwear. Traditionally, wearing of gold and precious stones was strictly for royalty. As such the wives of these Radalas didn't wear any jewelry for many decades. When the wives did start wearing jewelry in the early 20th century, the jewelry was made of silver plated copper. The stones were coral and not precious stones. It took almost a century of liberalization for them to start wearing precious stones such as rubies and gold jewelry. The 'New Radalas' were anglicized, loyal to the British and not even Kandyan but from the low country western province. They established themselves in the Sabaragamuva province which bordered the western province. It was from here that the British conspired to end the Kandyan kingdom. 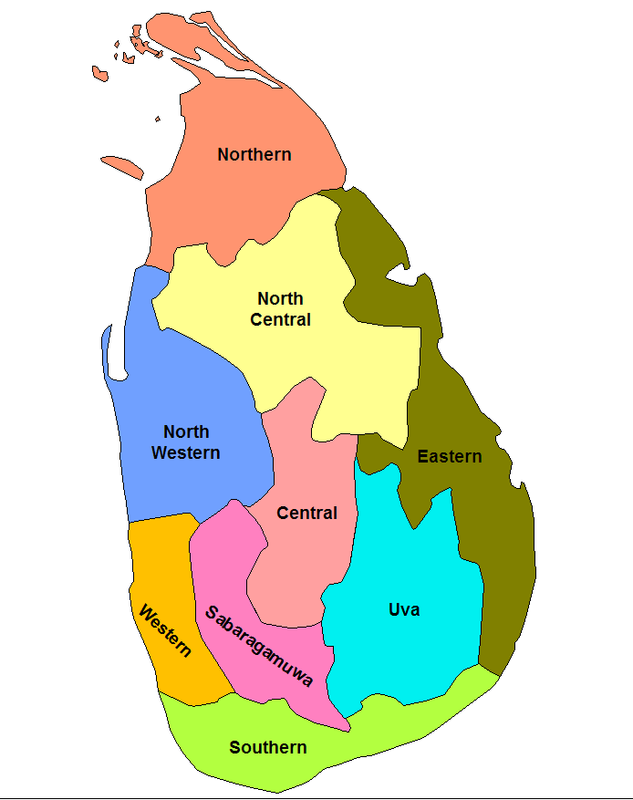 Most 'New Radala' families established themselves in the Sabaragamuwa province (coloured bright pink on the map) and not in the 'Kandyan' Central province. Sabaragamuwa is adjacent to the Western province and that explains the Western province origins of many of these families. See case studies below. Sabaragamuwa province is made up of Kegalle District in the north and Ratnapura district in the south. As these families were from the south, most of these familes were in the southern part of the province; in Balangoda, , Kiriella, Elapatha, Eheliyagoda, Pelmadulla and other villages of the Ratnapura district. Most of the traditional Radalas perished in the many wars, rebellions and conspiracies of the 18th and early 19th century. In one conspiracy plot alone 73 chiefs and their families are reported to have been killed by the misled and enraged Kandyan king. (Pieris 1939 pg 176). After the conquest of the kingdom, the remaining families were impoverished due to lack of royal patronage. Some of the names of extinct families (they are mostly names of villages where the court official lived rather than personal names, clan names or titles) were taken on by the 'new Radalas'. The jewelry now worn by kandyan brides are in imitation of the ornaments worn by the Karava Vaduga queens of the Kandyan kingdom. 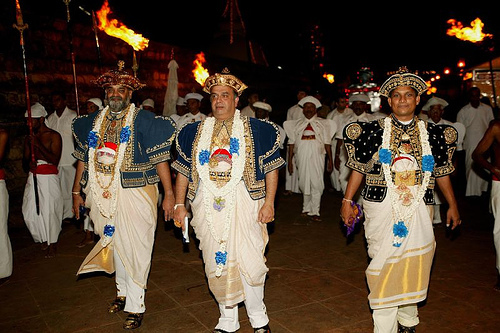 Although such ornaments are now worn by Kandyans who claim high status. Radalas and other non-royal women could not wear such ornaments during the period of Kandyan kings. Of these ornaments, the sun and moon hair decorations signified the descent of the Vaduga queens from the Solar and Lunar royal dynasties (Suyavansa and chandravansa- Solar and Lunar clans of the Karavas); the forehead bands signify the forehead plates of kings. The ear ornaments in the shape of overturned cups signified their Lunar dynasty descent; the seven necklaces represented the royal Siribomala ( see Karava marriage customs) signifying the Karava Bo-tree (Sirisangabo) dynasty the legitimate claimants of the Sri Lankan throne. Traditionally, Radala was not a common term used for all officials of the state. In the Sinhala version of the Kandyan Convention of 1815, only the Adigars, Dissavas and a few others are called Radalas. The 19th century British rulers who created an extensive class of ‘New Radalas’ in the Kandyan territory have been keen to call them an Aristocracy. This misnomer remains todate. However Sri Lankan history shows that the Kandyan Radalas were at best military officials, and during the last phase of the kingdom even civil officials of the court and were ritually never considered aristocratic or heirs to the Kandyan throne. Favourite concubines frequently received land grants and their offspring were appointed as high officials of the royal court but could never inherit the kingdom. 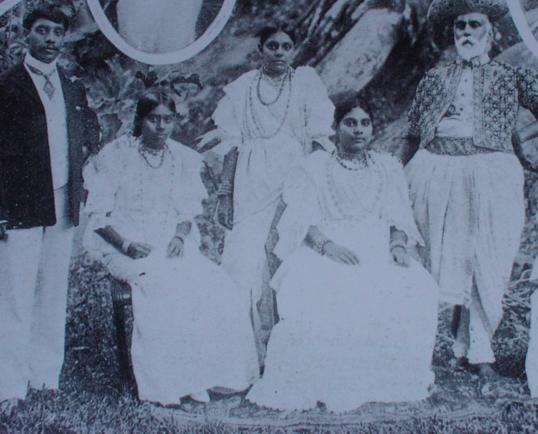 As a result of this taboo Mampitiya Bandara and Unamboowe Bandara, born to commoner yakadadolis, were never considered as heirs to the Kandyan throne. The status disparity between royalty and the Radalas was so great that the Radalas called themselves ‘servile dogs’ (Balugettás) in the presence of the king and prostrated in full while maintaining the ritually allowed distance to demonstrate their lowly status vis a vis the king (This practice continued into the British period and the Kandyan Chiefs had to prostrate before the British Governor and remain kneeling in his presence until this custom was abhorred as a degrading form of ancient tyranny and abolished by the British in 1818 under the proclamation of November 21st, 1818 by Governor Robert Brownrig). 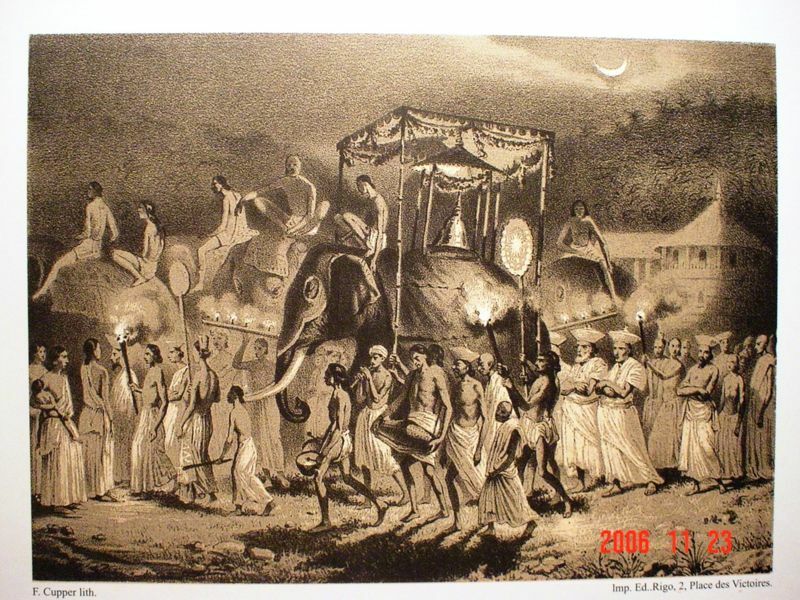 Right: A lithograph from 1841 showing traditional Nilames walking in the Kandy Perehera. This is in stark contrast to some modern Nilames who organize pageants to give the impression that the pagent is being held to honour them rather than the relic, and now even walk under umbrellas which were previously carried in the procession to honour the relics. Paintings and illustrations from Knox (AD 1681), Heydt (AD 1736), Jan Brandes (AD 1785), Johnville (AD 1800), Littleton(AD 1819), Davy (AD 1821), Forbes (AD 1841),Van Dort (AD 1885), Patterson (AD 1919) and others show that the Nilames of the Kandyan kingdom went barefoot and never dared to use ceremonial umbrellas. 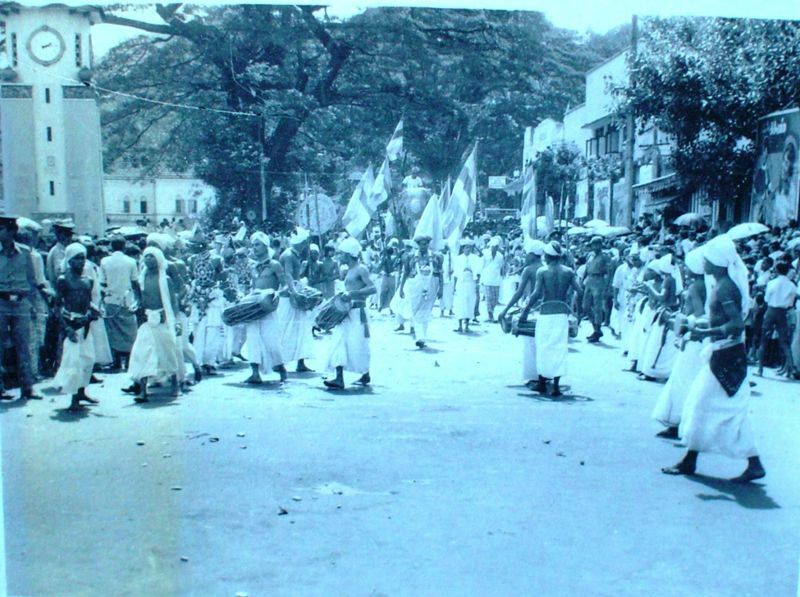 The 1828 description of the first Kandy perahära held after the British conquest also shows that all Basnáyaka Nilames, Dehigama, Dunuvila, Madugalle, Nugawela, Unambuve and others personally carried umbrellas in the perahära. They did not dare to walk under them in breach of tradition. Apart from having to continuously kneel or prostrate in full in the presence of the King, the Radalas too had to rise from their seats just like all other commoners even when the king’s dirty linen was taken past them (A Historical Relation of Ceylon, Robert Knox, Part II, Chapter2). They were not permitted to use royal insignia, swords, umbrellas, jewellery or even wear shoes. Most Kandyan chiefs were merely personal attendants of the King. The Diyawadana Nilame was the King's personal valet and he was responsible for bathing, dressing and clipping the nails of the king. The traditional Kandyan Radala of the past had considered themselves to be an exclusive caste and not part of the Govi caste. Bryce Ryan observed as recently as 1953 that Radalas repudiated Govi caste connections and that the status of the Govi caste remained low in villages where the Radala existed (Caste in Modern Ceylon, page 99). 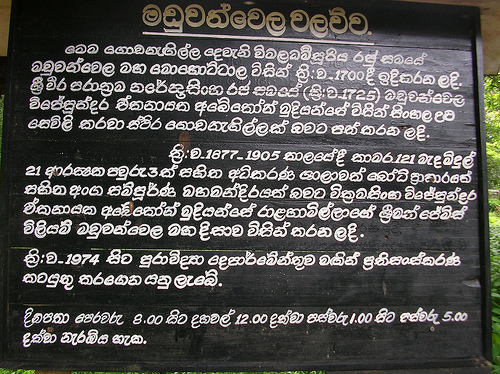 The demand by the Kandyan Radala elite for a separate federal state in independent Ceylon, the representations made to the Donoughmore Commission and the formation of the Kandyan National Assembly (KNA) as recently as in 1924 demonstrates the reluctance of the Kandyan elite to be governed by arriviste low country Govigama families which was to be the inevitable outcome of the British departure. After capturing the Kandyan provinces in 1815, the British soon created an extensive class of ‘New Radalas’ in the Kandyan territory to assist them with its administration. As much as the British created a class of Sri Lankan Mudaliyars in the low-country, this class too comprised of natives who were most likely to serve the British masters with utmost loyalty. They were from families that had either cooperated with the British to capture Kandy or from families that had joined the cause later. Many were from Sabaragamuwa, the province from where the British conspired to capture the Kandyan kingdom. They were all from anglicized families and many were considered pillars of the Anglican church. They and their children had English names and additionally they had a string of high sounding Sinhala names taken on when receiving their appointment (mostly Ratemahattaya positions after a life of loyal service to the British as a court clerk). Some of these names were from Kandyan families that had ceased to exist or from purported ancestors with tenuous connections. Several of them had married into successful and influential low country Mudaliyar families such as Gate Mudaliyar, Samuel Jayatileke's family (see profile below). Ironically it was the connection with these low country Anglican families that gave many ordinary Kandyan families their so called 'Kandyan aristocratic" status. In 1799 British Governor Frederic North established a Seminary in Colombo to educate willing Govigama and Vellala youth - Mostly from Buddhist and Hindu families where the Fathers were willing to send their sons to a Christian school.. Many of these Govigama youth subsequently founded loyal new-Radala families as expected of them. 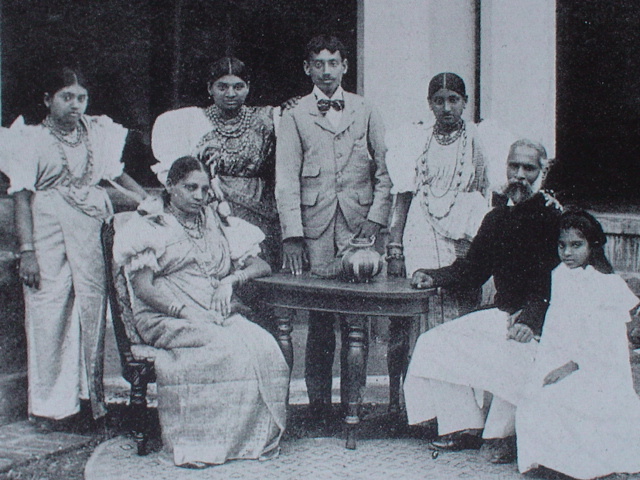 British Governor Gordon created two new Kandyan provinces (Uva in 1886 and Sabaragamuwa in 1889) to provide unchallenged prominence to these new-Radalas. Gordon loved the hospitality and veneration he received from these families and conferred many Adigar and Disava positions on them. Most of these British appointed chiefs and headmen in the Sabaragamuwa province derived great wealth from gem stones mined on the properties that now came under their control. Under the traditional system, all gems found on such lands had to be given to the King. The penalty for transgression was death. But the extinguishing of the Sri Lankan royal line and the introduction of private ownership of land by European rulers enabled these families to amass vast fortunes. 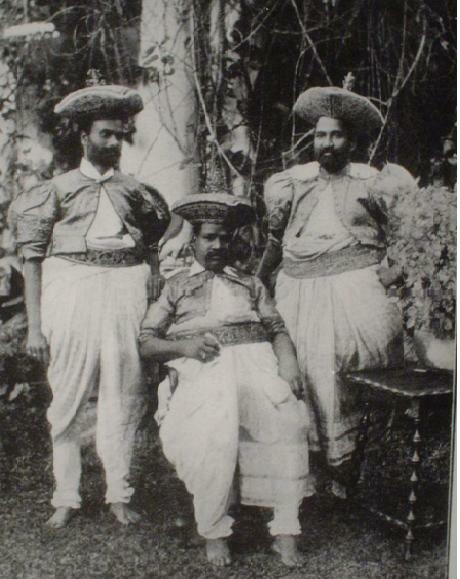 Right: Group of Kandyan Chiefs (probably Ratemahattayas - an honourary position given by the British to loyal Clerks of the Land Registry ) early 1900s - bold enough to dress as Dissawas of the past but not bold enough yet to take on traditional insignia of high office such as jewelry, ceremonial daggers or footwear. They generally held ‘Rate Mahattaya’ positions at the pinnacle of their career after a long loyal career as clearks translating native land records in provincial land or road departments. Almost all of them had studied under leading Anglican Priests at the Anglican missionary schools St. Thomas (Colombo) , Trinity College (Kandy) and High School Ratnapura. These were institutions set up by the British specifically for producing a class of loyal, local assistants for the British administrators. With each successive batch of British Civil Servants and Governors arriving in Sri Lanka, this group created and presented a greater and higher appearance of aristocracy and pseudo Kandyan lineage. 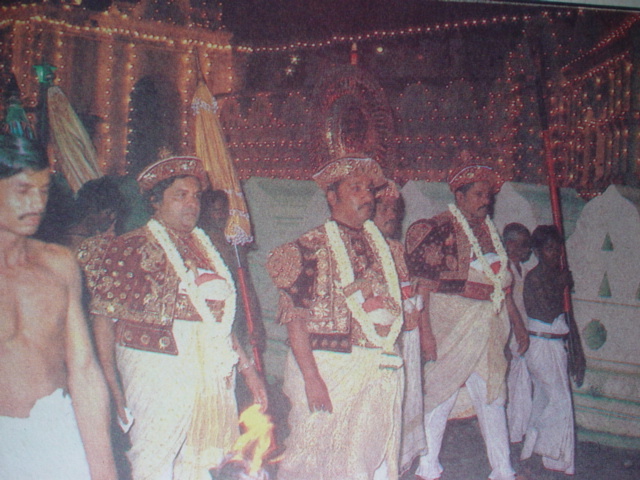 Right: Nilame in Kandy Perehera in 1977. They had by then started to wear footwear although it was inappropriate to do so in the presence of the relics. However they still hadn't started walking under the ceremonial umbrellas. Despite the scorching heat, in 1977, the umbrellas were still being carried in the procession purely to honour the relics - not in honour of the Nilames. 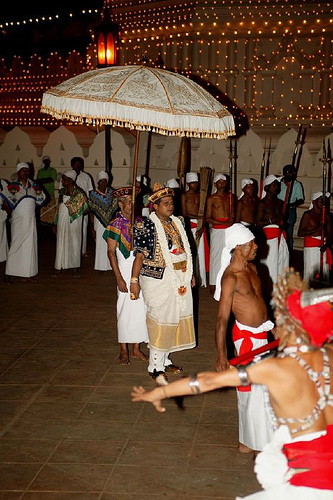 Click here for an example of a modern Nilame wearing shoes and gold jewelry and walking under an umbrella in the August 2008 Kandy perehera. In the past, these ceremonial umbrellas were carried in Kandy pageants solely to honour the holy relics. Not for the glory of Nilames. When traditions started to slip, the Sri Lankan government of the day was forced to put a stop to such abuses by Gazette notification of 17/04/1935. This notification states that the privileges and honours of Nilames were limited to the Kandyan costume only. They were not permitted to wear a sword or a sword belt or to have whip crackers, dancers or tom tom beaters before them. Click here for an example of a few Nilames in the same pagent who still honour the relics, the law of the land and the traditions associated with the pageant. 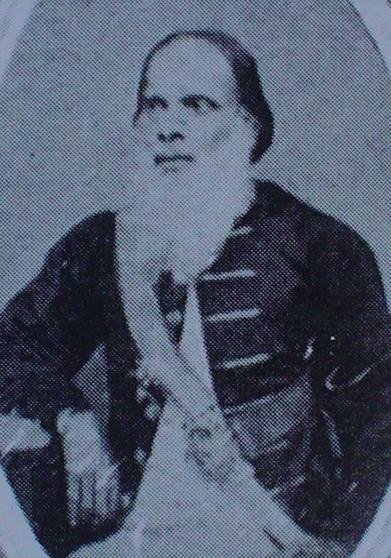 William Ellawala born 1834, son of Banda from Sabaragamuwa. Educated at Ratnapura School and St Thomas'. Appointed as a Rate Mahattaya in 1856. 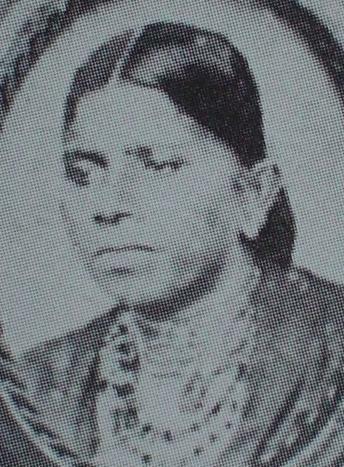 Married Jane Petronella , daughter of Don Bartholomew Mudaliyar from Panadura (as such she appears to be the sister of Don Spater (D. S. ) Senanayake who was the father of D. S. Senanayake). 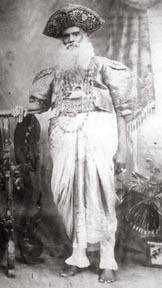 William Ellawala's daughter Agnes married Mahawalatenne Rate Mahattaya of Balangoda and their daughter Rosalind married Barnes Ratwatte Dissawe (b:1883 d:1957). Barnes Ratwatte’s daughter Sirima, married S. W. R. D. Bandaranayake. 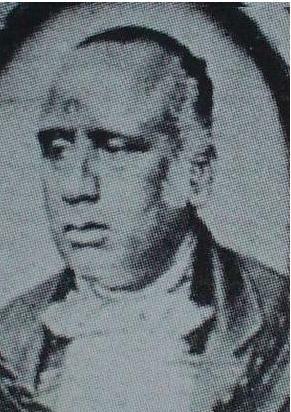 Sirima Bandaranaike’s father Barnes Ratwatte Disava (b:1883 d:1957) and his brothers Adigar Cuda Ratwatte and Harris Leuke Ratwatte Disava (b:1900 d:1964) are sons of a Abeyratne Banda Ratwatte of Mahaiyyawa. However Abeyratne Banda's father was a Paranagama and not a Ratwatte and as such these families shoud normally go as Paranagamas and not Ratwattes. However, the two brothers and the sister of Abeyratne Banda have gone as Paranagamas. The connection between the above three Ratwatte brothers - British appointed chiefs from Sabaragamuwa and the Ratwattes of the Kandyan court who were from Udasiyapatuwa in Matale is not very clear. 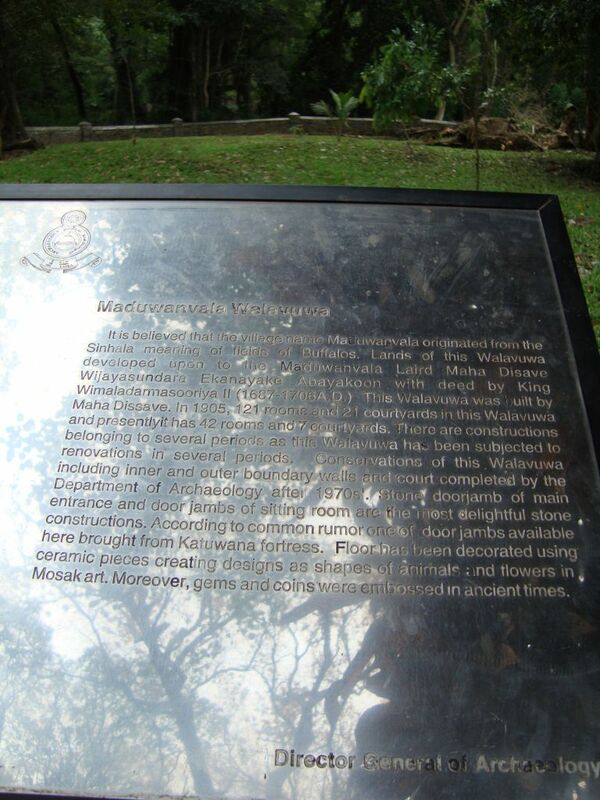 However although there isn't a village named Mahawalatenne in the gazetteers of the Kandyan province, there had been a village called Metiwalatenne (probably a pottery village) in upper Dumbara.. The above British period house is now a hotel and their web site says that the house was inherited by the Kandyan king’s chief minister, Ratwatte Adigar in 1803. The foreigners managing the hotel have obviously been misled by someone as the Kandyan kingdom never had a Ratwatte as an Adigar and the house in question is a late 19th century British period building (corresponding with the time that Ratwattes became Adigars by serving British masters) and definitely not a Kandyan period building from 1804. John Henry Meedeniya, had told Arnold Wright that his Father was a Loku Banda (nothing more is known about this Loku banda). 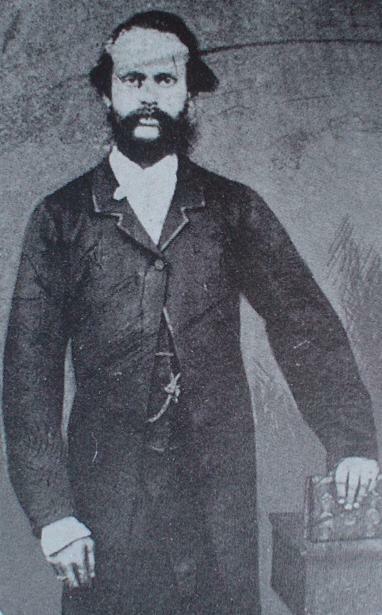 John Henry was educated at St Thomas, entered public service as a Clerk at the Colombo Kachcheri in 1886. After serving in several posts including that of Deputy Coroner, he was appointed as a Rate Mahattaya in 1897. 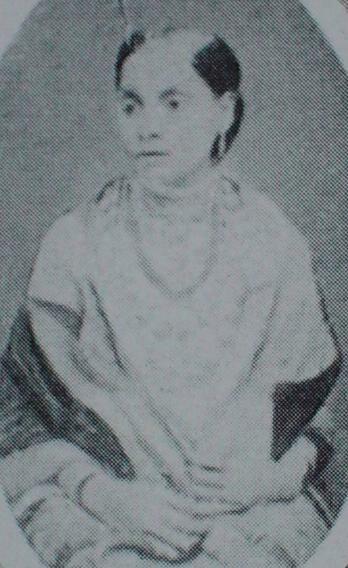 Married Cornelia Magdeline Senanayake, daughter of a low-country Anglican priest. It was D. R. Wijewardena who introduced a spurious Lion flag as the Royal flag of Sri Lanka. See Lion Flag myths. D. R. Wijewardena worked closely with the Senanayake brothers who introduced divisive politics based on caste, race and religion to Sri Lanka. see Time Line IIfor the early 20th century period. He also used all his influence to deprive the south of a University and instead got it built in Kandy. A Hall of residence of this University built with public funds is now named after him. 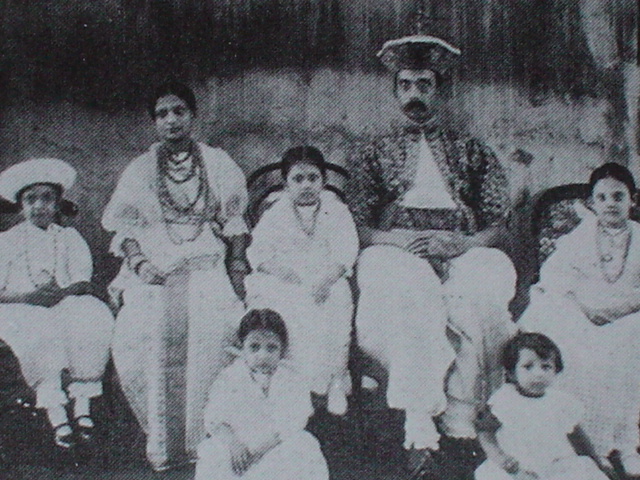 R. A. R. P. W. M. (Rajakaruna Anada Rajapaksa Pandita Wasala Mudiyansege) Philip Bartholomew Palipane with his family. Note his low country dress in above photo - coat and a cloth worn short to show the trouser legs. K. W. G. T. H. M. ( Kandegedera Wijesundera Guneratne Tennekoon Herat Mudiyanselage) John Graham Tennekoon and his family. His wife Ellen Georgiana too was from the low country. She was the daughter of Mudaliyar Joseph de Silva Jayasundera. Note his low country dress in above photo - coat and a cloth wrapped around to cover the western trousers. 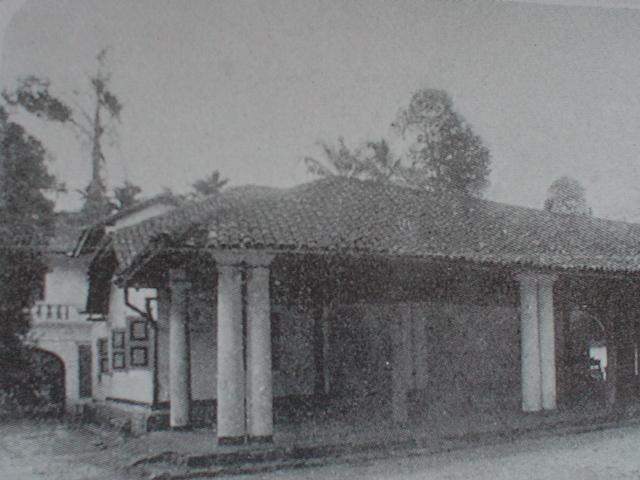 left: Posing with the house he built in Kurunegala in late 19th century and named "Wehera Walauwwa"
S. W. K. A. 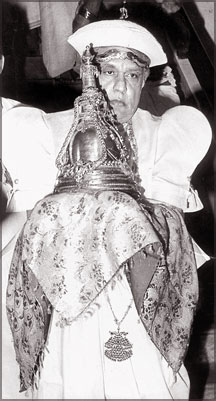 B. J. M. R. T. B. Panabokke ( Samastha Wickrama Karunatilleke Abhayawardene Bhuwanasekera Jayasundara Mudiyanse Ralahamilage Tikiri Banda Panabokke. Born in 1846 and educated in Colombo at the Kotte Institute and St. Thomas's College appears to be the founder of this family. He too does not appear to have had a notable ancestry. Only vague claims about his ancestry have been made in 1900 to the compilers of 20th century Impressions. For some reason he also hasn’t mentioned about his two marriages. They were to daughters of two ordinary Ratemahatayas but the family genealogy now calls them “Kumarihamys”. 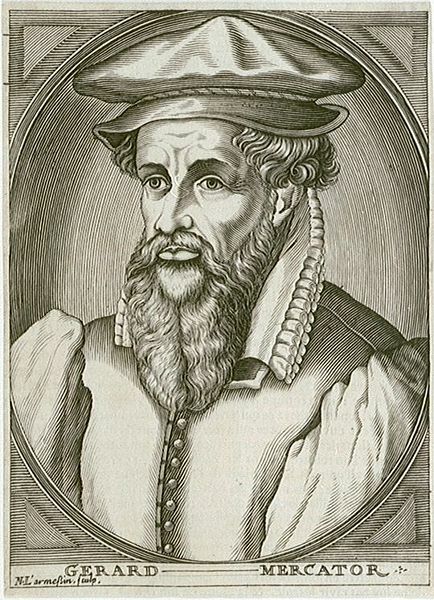 The ten names used by him also suggest that they are names acquired during the British period, as and when the British administrators made the several appointments. Left: Dressed up and waiting for the Prince of Wales - Kandy 1876. Just 3 years after he was appointed as a Rate Mahattaya by the British to trial their Village Tribunal system. Below: At the peak of his career circa 1902 after he was appointed by the British as the Kandyan representative in the Legislative Council. At age 22 he worked as a police officer in the central province. Four years later he was selected by the British administrators to trial the Village Tribunal system. In 1873 he was made a President of a Village Tribunal and appointed as a Ratemahataya in 1886. 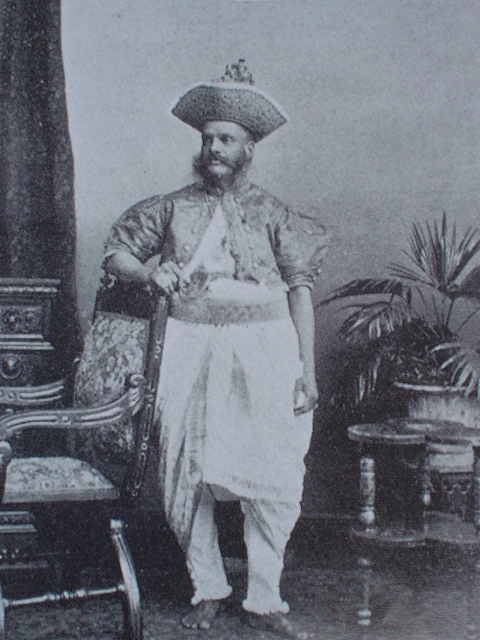 In 1889 he was appointed to the Legislative Council to represent Kandyans. He was the author of the spurious book called 'Nithi Nighanduwa' which was written to falsely position the Govi caste as the highest caste. It led to the terrible caste controversy at the tail end of the 19th century. It has been suggested that the publication was intended to help the 'divide and rule' policy of the British administrators and that Panabokke was a willing collaborator. 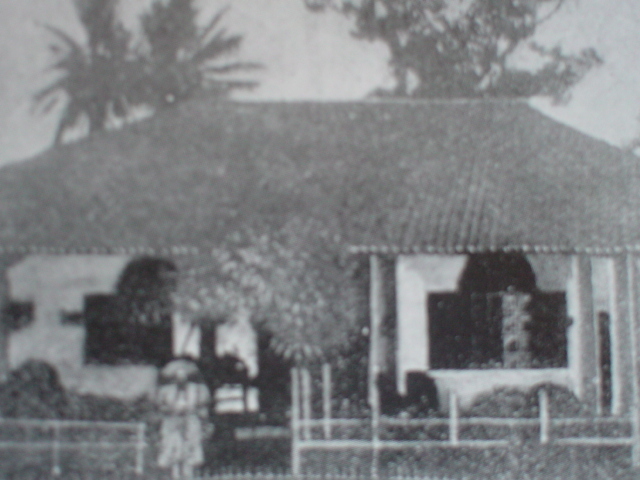 Right: The British colonial style house built and named by him as 'Panabokke Walauwwa' . 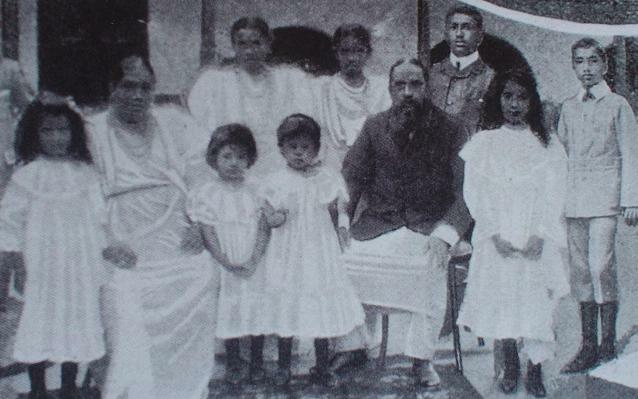 W. G. T. H. M. C. E. T. Ennaruwa ( Wijesundara Gunaratna Tennekoon Herat Mudiyanselage Charles Edward Tenekoon Ennaruwa and his family. Pillars of the Anglican church. Son, Charles Wilmot and daughters: Flora Ethel and Frances Alexandra Elsie. Born 1851 (he claims that his mother was one Dingiri Kumarihamy - unknown provenance. He doesn't say anything about his Father) and educated at St Thomas's College, in 1871 he commenced his government service at the Registrar's office in Kurunegala. appointed President of Village Tribunals and a Ratemahataya by 1876. As done by Palipane Ratemahataya, he too married a daughter (Elizabeth Florinda) of Gate Mudaliyar s. Jayatilleke of Kurunegala profiled in right column. Right: G. A. W. H. M. U. B. ( Gooneratne Atapattu Wahala Herat Mudiyanselage Ukku Banda) George William Dodanwela. Below: John Graham Jayetilleke and his wife Dorothy Petronella. The marriage of their daughter Mary Anne (below) to the son of John Marcellus Lewis appears to have elevated the young man's social status. In 20th century Impressions, he has chosen to associate himself with his wife's family rather than with his own. It's ironic that many of the Ratemahatayas who pretended to be Kandyan aristocracy and formed notable Kandyan family lines married the daughters of low country Anglican Christian Mudaliyars such Mudaliyar Jayetilleke in order to socially advance themselves. 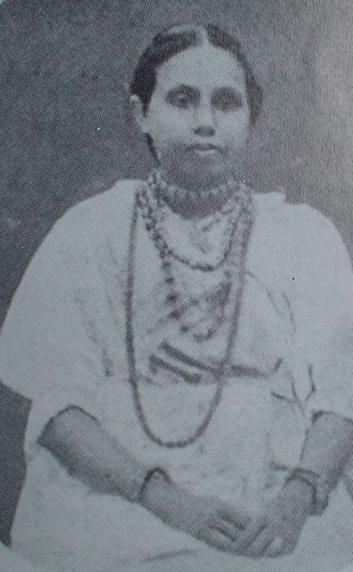 Mudaliyar Jayetilleke's daughter Dorothy Sarah is said to have married Palipane Ratemahataya whilst another daughter Elizabeth Florinda is said to have married Tenekoon Ennuruwa. One would speculate that Mudaliyar Jayetilleke must have been wealthy and influential. However it is curious that there is hardly any information about him either in 20th century impressions or else whwre. He was probably connected to John Graham Jayetilleke featured above, who also supplied sought after brides to Ratemahatayas. Dr Nissanka Wijeyeratne, from yet another southern family of British period Notaries who quickly became Kandyan Radalas during the early 20th century via the Sabaragamuwa province. See biography. 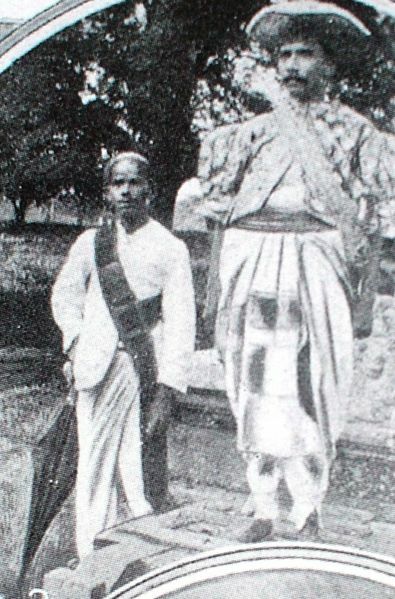 Right: Abeykoon Mudiyanse Ralahamilage James William Maduwanvela, who was appointed by the British as a Rate Mahattaya. Right: a stone plaque placed at the walauwwa by the Archaeological Department attempting to give an ancient date for this building. Click here for a larger image of the plaque and note the number of grammatical errors made by this Commissioner General of archaeology in addition to his errors on history. A great effort has been taken by the state to portray Maduwanwela as a patriotic native aristocrat - a black prince !. However James William Maduwanvela is no different from the other new Radalas of the British period. He too had been educated at St. Thomas' and he too was from Sabaragamuwa. In fact his father was a Molamure. But he had assumed the name Maduwanwela claiming that it was a maternal name. The modern folklore developed by interested parties portray him as a bold Sinhalese who ridiculed and abused the British. One yarn even claims that British officers who arrived late were tied to trees and whipped by Maduwanvela's servants. These stories however are far from the truth. Maduwanvela earned his fame, fortune, promotion as a Dissawa and subsequent knighthood by pandering to the whims and fancies of the British civil servants. Maduwanwala was loved by the British officers because of the frequent elephant kraals organized by him to capture wild elephants. Many elephants were hunted down as well. This sprawling collection of buildings had been constructed mainly for the comfort of these visiting British officers. Dr. R. L. Spittel says: "He was a perfect host and always fond of good company. When coffee was in its glory, every week-end the planters would ride down to his place for tennis, racing and bibulous merriment. A great friend of the old planters, he helped them many a time to open their lands, buy drafting to their service at sudden notice a labour force of even five hundred men." Below: A prominent notice placed at the entrance to this walauwwa by the Archaeological Department attempting to give an ancient date for this building. It attempts to take the ancestry of James William Maduwanvela to 1700, the reign of King Wimaladharmasuriya although there are no such traceable Maduwanwalas before the British period. This appears to be another state sponsored attempt at spreading the Govi Supremacy Myth, This particular notice is targeting the Sinhala speaking public and attempting to make them believe that former chieftains were from the Govi caste.. Click here for a larger image of the notice. 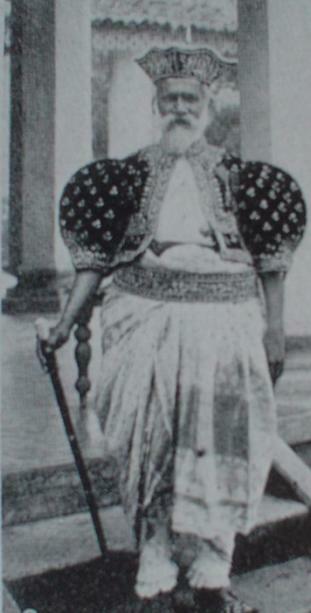 Below: The traditional Spanish / Portuguese costume from which the Sri Lankan - now considered pure Sri Lankan- "Lama Sariya" originated. Journal of the Royal Asiatic Society of Sri Lanka (JRASCB) . Peebles Patrick 1995 Social Change in Nineteenth Century Ceylon Navrang ISBN 81-7013-141-3. Wright. Arnold 1907 Twentieth Century Impressions of Ceylon : Its History, People, Commerce, Industries and Resources London.